Common house spiders, they’re in your walls, attic, making random cobwebs in parts of your house, but what do you really need to know about them? Just looking at a spider, most of us get a weird nervous feeling you can’t really explain, but it’s there. Some of us feel the urge to instantly want to whack the little critters (sometimes a large urge) into oblivion, while others want to capture the bug and set him free. When it comes to common household spiders however, there’s a couple key things to be aware of. In this article we’ll break those key things down. What are the types of common house spiders? 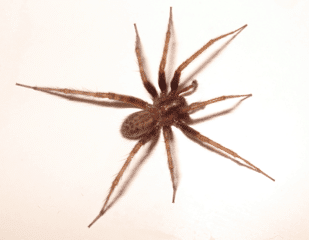 According to an article published by University Of Minnesota, there are two main categories of indoor house spiders. The first are hunter spiders and the second are web-building spiders. Hunting spider consist of wolf spiders (big hairy creatures), sac spiders, fishing spiders, sowbug spiders, jumping spiders, parson spiders, and crab spiders. These guys like being outdoors more than inside your home. If you find one, it’s likely they came in by mistake and are actively trying to find a way outside. Web-building spiders are the types you’re likely to find in your home. Cobweb spiders: These spiders are mostly responsible for those random cobwebs strewn about your house. The most common type of cobweb spider you’re likely to find is the American house spider. They’re grayish/brownish with chevron markings on its abdomen. Orb Weaver Spiders: Another web-building spider, but they are less likely to make their way into your home. Rather, the orb weavers like to hang out in your garden making those elaborate “spider webs” you’ve seen all your life. Orb Weaver Spiders come in all sorts and sizes, such as black and yellow, brightly marbled, and brown and yellow (think Charlotte’s Web). Funnel Weaver Spiders: Also known as “Grass Spiders” Funnel weaver spiders are brown and love to build webs on the ground in and around the grass. Do common house spiders bite? In the case of humans, no, common house spiders don't bite. Some uncommon ones might (black widow, brown recluse). Spiders aren't blood suckers, thus they have no real reason to bite humans. Even if they did, they wouldn’t be able to piece your skin. There are about 40,000 species of spiders, of which only about a dozen can actually hurt a human being and even less are life threatening if bitten. Unless you live in Australia or South America, your chances of coming into contact with a deadly spider AND being bitten AND potentially dying are insignificantly small. Black Widow (Can be found worldwide): If you live in the USA, this is the first of 2 spiders to be aware of. These spiders are easily identifiable with their red hourglass backing and contributed to about 2,200 reported bites per year. If they do come inside your home, they’ll find safety in your shoes or other small spaces. Brown Recluse (Can be found in North America): Mostly native to the western and southern parts of the U.S.A, this is the second most dangerous spider bite to be aware of. They like to hang out in wood piles, sheds, cardboard, and other dark damp places. They are timid spiders, so as long as you don’t threaten it, you’ll be okay. Brazilian Wandering Spiders (Can be found in South America): Sometimes known as Banana Spiders hiding in packs of bananas, these little devils can be found in Costa Rica, Columbia, and other South American territories. This is one of the most deadly spider groups in the world. But unless you find yourself exploring the forests of the amazon, you can sleep knowing you’ll likely never see one of these suckers. How dangerous are common house spiders? Not very dangerous at all. Like I mentioned above, the most common house spiders (Daddy Long Legs, American House Spider, etc) do not have the required teeth or venom to do any significance damage to you. Spiders pose no real “physical” threat to you or the safety of your family. I can’t speak for your emotional well being however, because spiders still look scary to most people. One myth worth debunking is that a Daddy Long Legs venom is strong enough to kill a human, but their fangs are too weak to penetrate your skin. 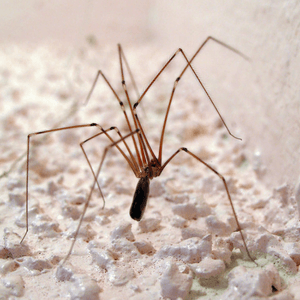 UCLA published an article on myths surrounding daddy long leg’s bites, debunking the theory as there is no verifiable evidence that if injected the venom from a daddy long legs could hurt a human. The Black Widow isn't necessarily "common" but is worth noting. Unless provoked, the dangerous spiders don’t want to bite you. The thing is, when you accidently put your foot into a shoe that they were hiding in, then they’ll feel threatened and defend themselves. How to get rid of common house spiders? Spiders don’t want to be in your home, despite how great your home may be, it’s not their residence of choice. The only reason they would make their way inside is if they thought there was dinner to be had. Relocate vegetation away from your house: This will give spiders less incentive to hide near your house. Turn off your lights: Spiders aren’t attracted to light, but other bugs are. Spiders will go where there food is, keep your lights off and that should help. Close up any gaps in your house: Check your house’s siding, eaves, and overhangs for any other openings in your house. Close them up with mesh screen or duct tape if you’re in a pinch. Check for rotten wood: Rotting wood is a damp dark place, perfect for spiders to hide out and look for prey. Move those pieces away from your house. Make A Natural Repellent: Another option is concocting your own spider repellant. Take a look at the below video which describes an easy DIY method to keeping spiders at bay. Which states have the most common house spiders? Now if you’re asking yourself, “Well which states have the biggest spider problem?” The answer may surprise you! Or… maybe it won’t. Generally warmer climates will yield a larger bug population. Below, I’ve compiled data utilizing Google’s Trends tool to see by what location, and how often people were searching for “pest control services”. Granted this list might not be entirely about spiders, but it gives you an idea of where the bugs are in the United States. 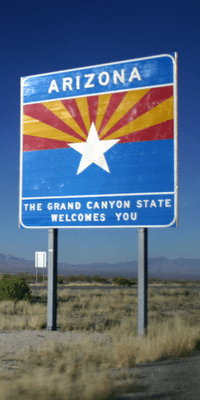 Arizona comes in at #1 ranking as the state that needs to most help when it comes to pests! Is there anything else I should know about the common house spider? One last piece of information I’ll leave you with is to full grasp how unlikely it is for you to be harmed by a spider. There are 40,000+ spiders with only about 12 The vast majority of spiders are of no threat to humans. Are they a nuisance? Sure. I hate spiders but with a few precautionary measures taken, you can reduce the amount of spiders in your house significantly. The common household spiders you see aren’t dangerous, they aren’t deadly, and they aren’t interested in you. In fact, they are quite the opposite. They hate being around humans. With the exception of the Australian funnel-web spider, which is a more aggressive and deadly spider (although, not common), spiders are docile. The two not-so common household spiders you should be aware of are the black widow and brown recluse. Both of why MIGHT find their way into your house accidently in search of shelter or prey, but are non-aggressive. By following the tips I laid out above, you’ll significantly reduce the chances you’ll come into contact with an unwelcomed guest. I will say, if you can tolerate a spider or two, they do help control the mosquito population (and in some cases the spider population when spiders decide to eat other spiders) in and around your house. Questions/concerns? Leave a comment down below.